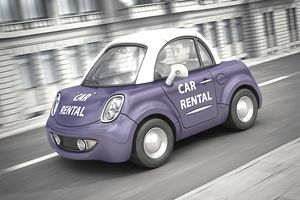 Many small businesses utilize rental vehicles in their day-to-day operations. Some rent autos frequently while others do so only occasionally. In either case, businesses should make sure that rental is properly insured for auto liability under a commercial auto policy. They should also consider insuring rental vehicles for physical damage. In commercial auto insurance, rental vehicles are called hired autos. The standard ISO Business Auto Policy defines hired autos as only those autos you lease, rent, hire or borrow. You refer to the named insured. Thus, the term hired auto means a vehicle leased, rented, hired or borrowed by the person or entity listed in the declarations. Note that the term does not include any auto you lease, rent, hire or borrow from an employee, partner, member (of a limited liability company), or a member of that person's family. Whether hired autos are covered for liability under your commercial auto policy depends on the covered auto designation symbols that appear in the declarations next to liability coverage. If symbol 1 (any auto) or symbol 8 (hired autos) is listed next to liability coverage, hired autos are insured for liability. Hired auto liability coverage applies to you (the named insured) and to anyone else who is driving a hired auto with your permission. You are covered whether or not you are actually driving the hired auto when an accident occurs. This is important since you (the business entity) are vicariously liable for accidents caused by vehicles driven by employees or anyone else with your permission. Most drivers of hired autos are employees of the business. For example, Susan is an employee of yours. You have asked Susan to represent your company at a convention in a town 250 miles from your office. Your company rents a car from an auto rental agency so that Susan can drive to the convention. Your firm is insured under a commercial auto policy that provides liability coverage for hired autos. While driving to the convention, Susan inadvertently rear-ends another auto. The driver of the other vehicle is injured in the accident. If the injured driver sues Susan, your firm, or both for bodily injury, your auto policy should respond to the suit. Auto Rental Agreements: When you rent an auto on behalf of your firm, the rental agency will ask you to sign a rental contract. The contract will likely require you to assume liability for bodily injury or property damage sustained by third parties as a result of auto accidents you cause during the term of your rental agreement. This assumption of liability is covered under the standard auto policy with two exceptions. First, there is no coverage for any liability you assume for damage you cause to the rental vehicle itself. (As explained below, you may elect to insure hired autos for physical damage). Secondly, there is no coverage for liability you assume under a contract in which you rent a vehicle with a driver. Coverage is Excess: Hired auto liability coverage applies on an excess basis. This means that your commercial auto policy will apply after other collectible insurance has been exhausted. An example of "other collectible insurance" is liability coverage your rental agency is obligated to provide under state law. If you are involved in an accident while driving a hired auto, the coverage the rental agency provides will apply first. Your hired auto liability coverage will apply after that coverage has been used up. The rule regarding excess coverage for hired autos has one exception. A trailer you've hired and attached to an auto you own is covered on a primary basis. You may elect to insure hired autos (other than those hired with a driver) for physical damage under Comprehensive and/or Collision coverage. Hired autos are covered for physical damage if symbol 8 appears next to comprehensive and/or collision coverage in the declarations. A deductible will typically apply. Unlike liability coverage, physical damage coverage on hired autos is covered on a primary basis. If a vehicle you hire is damaged in an accident, the rental agency will be unable to rent the vehicle to anyone else while the auto is being repaired. As a result, the rental agency may bill you for “loss of use”. Under the standard commercial auto policy, Loss of Use coverage is automatically provided if you purchase physical damage for hired autos. The policy provides up to $20 per day subject to a maximum of $600 (30 days). If the rental agency charges you more than $20 per day, you will be stuck paying the remainder as an out-of-pocket loss. Loss of Use coverage does not apply to autos rented with a driver. As noted above, the term hired auto means an auto rented by the named insured. Suppose that Susan (in the previous example) rents an auto for her business trip. When she fills out the rental agreement Susan lists herself as the renter instead of your company. While driving to the convention, Susan accidentally sideswipes another car. The driver of the opposing vehicle is injured in the accident and sues Susan and your firm. Will the lawsuit be covered under your hired auto coverage? Technically, an auto hired in the name of an employee is a non-owned auto. Some insurers may cover the vehicle as a hired auto anyway, but others may be sticklers. If your policy covers non-owned autos, your company should be covered for the suit. However, your insurer may refuse to cover Susan. Under most commercial auto policies, employees are not insureds while driving non-owned autos. Fortunately, you can ensure employees who rent autos in their name under an endorsement called Employee-Hired Auto. ISO rules distinguish between leased autos and hired autos. The term hired auto means a vehicle rented or leased for a period of fewer than six months. Autos rented for six months or more are usually referred to as leased autos. Leased autos are typically added to the policy via an endorsement. They are insured for liability and physical damage in the same manner as owned autos (on a primary basis).